A predisposition to certain forms of disease. It has been observed by physicians at all times that some races are more prone to be affected by certain diseases than are other races. These peculiar tendencies have sometimes been due to somatic characteristics, and in such cases the diseases are designated as "racial." But in the majority of cases these diatheses are due to certain habits of life, diet, or environment, or to social causes; and the diseases which result from the diatheses can not be called "racial," because when the social conditions are changed the liability to the disease disappears. The nervous diathesis has been universally observed by medical men to be peculiar to the Jews. Some physicians have even gone so far as to state that the majority of Jews are hysterical or neurasthenic—neuropathics or psychopathics. How far this is true will be found in the articles on Insanity and Nervous Diseases. French writers like Charcot, Lancereaux, and Féré have said that rheumatic and gouty diathesis is more wide-spread among Jews than among any other European race. The groups of diseases recognized by the French under the names "arthritism" and "herpetism" are by some writers said to be common among the Jews. By "arthritism" they understand a certain group of diseases, usually due to disturbances of the normal metabolism, which manifest themselves primarily as chronic rheumatism and gout, but which also include other morbid processes, such as diabetes, gall-stones, stone in the kidneys, obesity, and some diseases of the skin. By "herpetism" is understood a group of diseases which manifest themselves in various forms of vasomotor disturbances, as some skin-eruptions, neuralgia, migraine, gastralgia, and nervous dyspepsia; various forms of trophoneurosis, pulmonary emphysema, and arteriosclerosis, with their sequelæ, apoplexy, softening of the brain, paralysis, etc. These disease conditions are not so prevalent among the Jews as some French physicians assert. Some, as the functional neuroses, are actually very wide-spread among them; others, such as arteriosclerosis, apoplexy, etc., are no more common among Jews than among other civilized races. The diseases which are most often met with among Jews are not racial in the full sense of the word. In the majority of cases they are due to their mode of life, to the fact that Jews are almost exclusively towndwellers, and to the anxieties of their occupations. See Apoplexy; Epilepsy; Insanity; Nervous Diseases; Skin-Diseases. 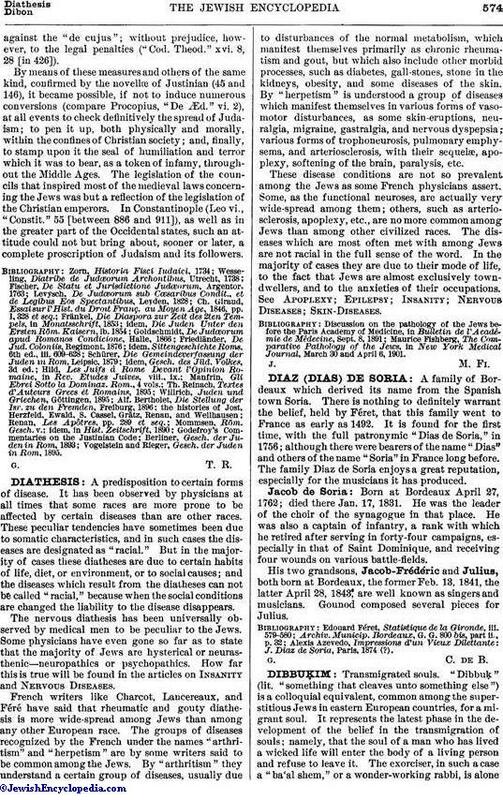 Maurice Fishberg, The Comparative Pathology of the Jews, in New York Medical Journal, March 30 and April 6, 1901.